Chaotic-That’s what aging skin’s cellular matrix looks like under a microscope. A disorganized cellular matrix equals thin, wrinkled, paper-y skin. There’s a fibroblast over there – and then some elastin over here, and a few new cells in that corner. This is NOT what young, firm skin looks like. Get your skin firm and organized again with our new Firming Densifier Active Treatment Moisturizer. Firming peptides Rubixyl® and Matrixyl® Synthe®6, Niacinamide, Red Algae extract, Mung Bean Sprout stem cells, Carob Seed extract and Sea Buckthorn Oil come together in a super-intensive firming, hydrating, super moisturizer cream for aging skin. Gradually, skin is repaired and reorganized into a tighter, firmer stronger cellular matrix. Skin becomes smoother, more elastic, even contoured. Over about 28 days, volume (yes, volume) and density are increased. So what causes this disorganization? Chronological aging, smoke, pollution, sunlight and excess sugar intake. The latter is especially damaging to skin as it promotes a process called GLYCATION. What is Glycation? Simply put, it’s when skin proteins are bonded without the proper enzymes being present. The resulting cellular matrix is brittle and stiff instead of supple and elastic. Red Algae extract reduces the level of glycation end products that damage the skin and restores the normal organization of the collagen and elastin matrix. Skin becomes firmer overall. In-vivo studies show that this process generally takes about 28 days. Firming peptides Rubixyl® and Matrixyl® Synthe®6 restore key epidermal proteins, replenish keratin, elastins, and lipid ceramides, and rebuild structural collagens. Think of these two peptides as your “facial architects” building strong, volumized line-free skin. Carob Seed Extract helps disorganized, damaged skin cells to recover, reducing redness and tissue damage from glycation and free radicals. Niacinamide (B3) helps skin retain it’s natural epidermal barrier protection. As that barrier is strengthened, skin is better able to keep moisture in and irritants out. Redness and inflammation are visibly reduced. Sea Buckthorn oil replenishes natural skin lipids, also helping to protect the epidermis. Garden Sprout (Swiss Garden Cress) supports your skin’s natural ability to clear away toxic enzymes while Mung Bean Sprout Stem Cells enhance firmness and elasticity. Generously-sized with an average of 200 pumps in each bottle. Usually two pumps each night are all most complexions will need. Large size orders allow an extra 10 days for delivery. 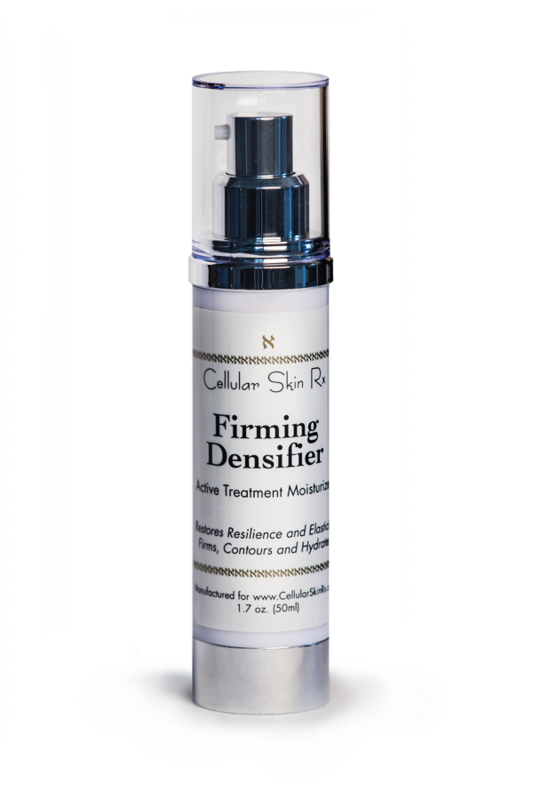 For more information, see Dr. Glow Girl’s blog on new Firming Densifier Active Treatment Moisturizer here. Allow extra delivery time for custom large size. Custom sizes are nonreturnable. Apply proper amount to cover face and neck at night, usually about two pumps. If skin is very dry/dehydrated, apply twice each day. Use after vitamin C+ Firming serum. Water, glycerin, cyclopentasiloxaine, cetearyl alcohol, neopentyl glycol dicaprylate/dicaprate, tridecyl stearate, dimethicone, bis-diglyceryl polyacyladipate-2, panthenol, cetearyl methicone, cetyl esters, propanediol, tridecyl trimellitate, wheat germ glycerides, coco-glucoside, glycine soja sterols (soy), phospholipids, hydroxypropyl cyclodextrin, laureth-4, phytostearyl isosterate, tocopheryl linoleate (E), peg-100 stearate, polyacrylate-13, ylangylang oil, grapefruit, clove, sunflower seed, peppermint, geranium oils, polyisobutene, polysorbate-20, citrus lemon extract, fumitory extract, fumaric acid, butylene glycol, disodium EDTA, ethylhexylglycerin, phenoxyethanol. Apply after antioxidant serums/complexes (vitamin C+ Firming serum, Antioxidant Defense Complex, Stress Recovery Complex). Firming Densifier Active Treatment Moisturizer is an extremely hydrating moisturizer. Most complexions will need to use it each night only. If your skin is extremely dry, apply twice each day. If you live in a very cold, harsh, wind-blown environment, apply twice each day. Always use moisturizers AFTER serums, especially serums that use hyaluronic acid as a base,(Relax-A-Line™, ULTRA Relax-A-Line™, SuperMax Multi-Peptide Skin Solution serum, ProgeniDerm™ Anti-Senescence Skin Stem Cell serum). NOTE from Dr. Glow Girl: Hello to all – I wanted to let my Glow Girls and Boys know about the fabulous results I got when I did the following a couple of nights ago. First I put ProgeniDerm mixed with CSRx Antioxidant Defense Complex all over my face and neck. Then I applied Retin-A 0.05% cream to every line I could see, crow’s feet, frown lines, vertical lip lines, naso-labial lines, marionette lines – anywhere I wanted to treat a line. I waited a few minutes and then I put my FIRMING DENSIFIER Active Treatment Moisturizer on top of every line where I had applied the Retin-A. Then I went to sleep. When I woke up the next morning, I was seriously shocked when I looked in the mirror and saw that most of my lines were simply GONE. My naso-labial lines could not be seen at ALL. I was truly shocked. Now, over the hours of the day, I noticed that the lines returned slightly, but overall, they were greatly dimished. There are so many ingredients at work here in the two serums, Retin-A and the Firming Densifier that I can’t say for sure which ones are directly responsible for my result. BUT I have not gotten this exact result before and I’m pretty darn sure it was the FIRMING DENSIFIER that did the trick. I’m going to keep up with this combo and I’ll keep you guys informed on if I can maintain my lineless results! My biggest fear — well, regarding my skin — are the terrible spidery lines that cause lipcolor to seep into and blur your lipline. (Too many mornings spent sucking on your iced coffee, or if you smoke *please stop*) I was so curious to see if CSRx Firming Densifier could help. It surpassed my expectation; their products always do. I can see a marked ‘filling in’ of the lines around my mouth, as well as softening of the marionette lines. Suggest you first apply their C serum, then one pump of the Densifier becomes ‘slippy’ enough to cover face and neck. I am grateful for this company: no puffery or extreme packaging, real active ingredients with real results. Thank you. Micki M.
This is the best moisturizer I have ever used. Also, I am very impressed with the time and care that you spend with your customers. Service like this is a rarity these days – well done! The Firming Densifier is a superb skin product for glycation. I have seen results very quickly. Thanks ever so much! Add a Lifting Eye Serum to your Firming Densifier Purchase for just $35! You save $8! Use Coupon Code ADD35 at checkout. This coupon code may not be combined with other coupon codes. Limit one per purchase.